Allowing the brush to dance…. 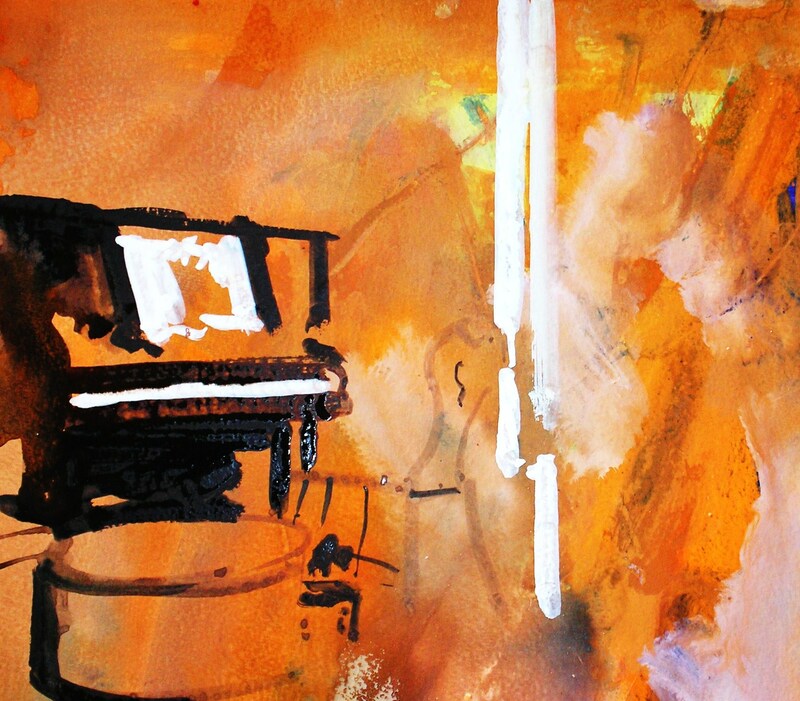 The following watercolour/gouache painting is an example of warming up, playing and allowing the brush to dance….. I cut an unsuccessful painting into quarters so that I could re use the paper for this and other images. Using a mix of Opera Rose gouache – plus a little permanent white gouache I rapidly indicate the flower heads….I use violet and Alizarin crimson to indicate the darker areas of the flower. Note that the underlying colour from the original sketch integrates with the flower. 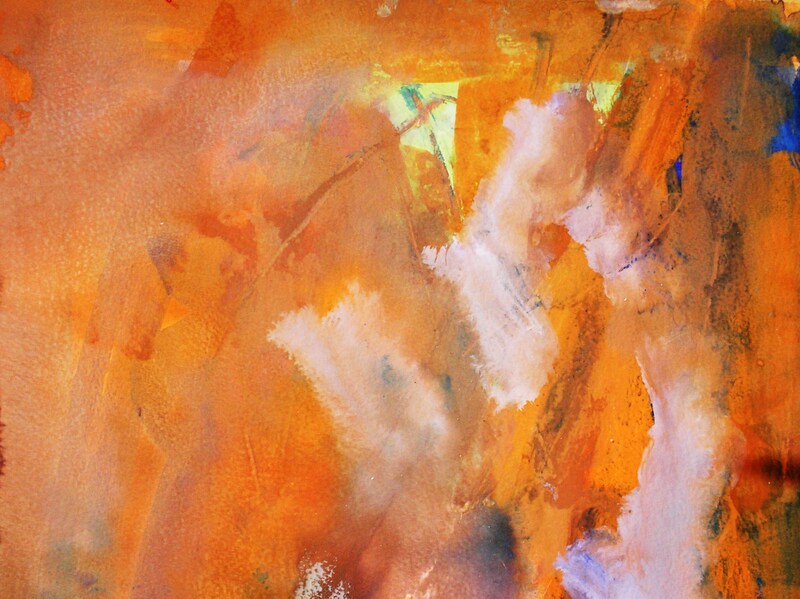 Allowing my brush to dance across the surface, using a mix of burnt sienna and prussian blue watercolour, I begin to indicate the stems and leaves. I have also added a little Winsor & Newton green gold – an expensive pigment, but one I highly recommend. Using a knife I scrape out some of the paint while still wet….which gives a sense of energy and movement. In the final frame, I mix some Green Gold with permanent white gouache to highlight areas of the image and to indicate seed pods. I also move more opera rose around the image to bring a sense of harmony and balance. This is all about spontaneity. Working like this is a great way to hone observational skills. The key is to let go, be playful and allow the paint to do its own thing……It also helps to work on several pieces at the same time. Here is a Magical Hummingbird to start the new week….. This entry was posted in Uncategorized and tagged allowing the brush to dance, an english country garden, colour grounds, English cottage garden, honing observational skills, HummingbirdHQ.com, janet weight reed, janet weight reed colourist, janet weight reed watercolorist, mixing watercolour and designer gouache, rapid floral watercolours, weight reed artist, winsor & newton on June 25, 2014 by janetweightreed10. I painted this image on the magnificent Amalfi Coast, Italy. 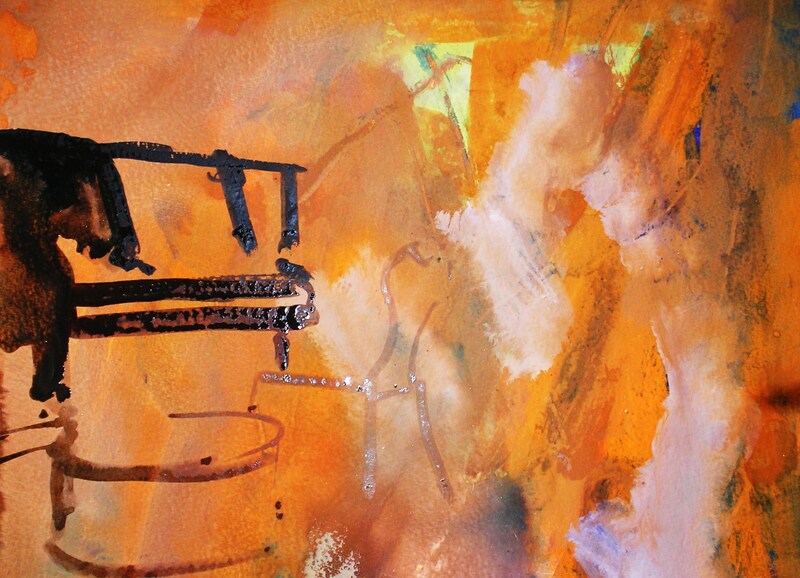 For this sketch I am working on a cadmium orange ground which I apply at least 24 hours before use. Because I am working on a colour ground, I am using a watercolour/gouache mix. Gouache is an opaque water medium with excellent coverage. I love the mix of transparent watercolour with opaque gouache. Using a burnt sienna/Prussian blue mix I indicate the darks of the composition, and also begin to move some of the other colours around the painting. Using designer gouache permanent white, I now begin to add the lightest areas of the painting, and continue to move other colours around the image to bring a sense of harmony and cohesion. Frame 4 – Final image. The workshop is for all levels, including total beginners. For more information go to. http://www.artinthealgarve.com. This entry was posted in Uncategorized and tagged Amalfi coast Italy, colour grounds, conca dei marini, designer gouache and watercolour, janet weight reed, watercolour landscapes, windsor & Newton on January 11, 2014 by janetweightreed10. I am planning to give some tutorials during the coming weeks, and given that I was talking about working from a colour ground at a recent workshop, thought I would begin with this one. I am using watercolour and designer gouache for this demo. Watercolour is a transparent medium….Designer Gouache is an opaque watercolour medium. When applying a colour ground to paper…make sure that it is at least 24 hours dry before working on top of it. In this instance, using cadmium orange, and whatever else was on my palette, I painted over an old watercolour that didn’t work for me. This is a great way to use old sketches/paintings. 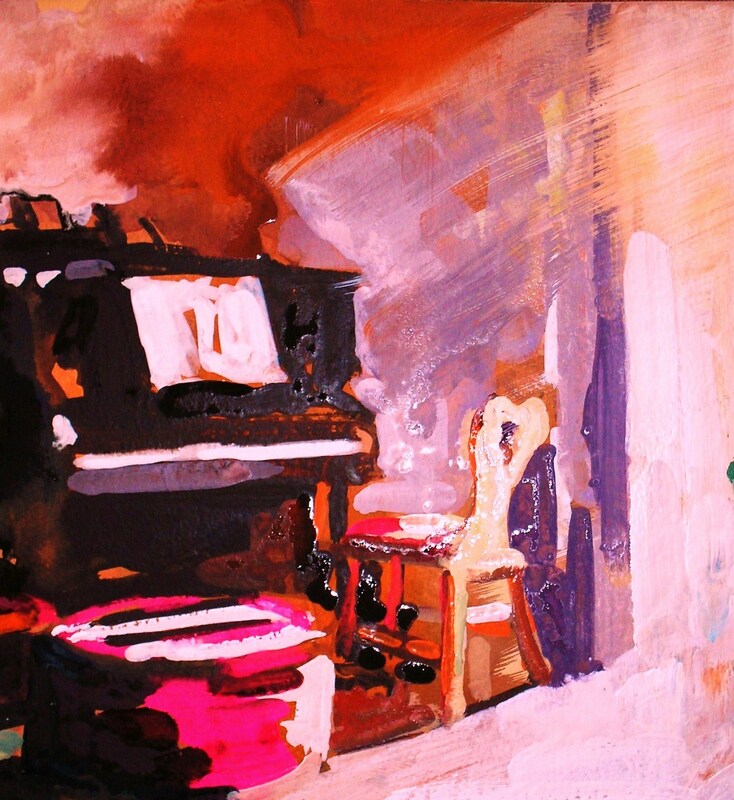 In this frame I have begun to sketch out the piano and stool using, a mix of prussian blue and burnt sienna watercolour. In frame 3, I add highlights, using Winsor & Newton Designers Gouache, Permanent White. In frame 4, I add the chair, using Naples Yellow, designer gouache ….and at the same time emphasised the light streaming in from the window. I use a wash brush to achieve the broad strokes of light. You will note that in the final frame, I have chosen to focus on the piano. I have heightened the reds and oranges, and also moved some of the naples yellow around the images, to achieve a sense of harmony. Note that I have added some violet for shadow tones. This is a very quick sketch…capturing the drama of light and dark. Painting over old sketches and using them as a colour ground is an excellent way to warm up, and use up papers. This entry was posted in Uncategorized and tagged colour grounds, darks and lights, designer gouache, http://www.janetweight reed.co.uk, janet weight reed artist, on line tutorials, warming up, watercolour gouache mix, winsor & newton on November 3, 2013 by janetweightreed10.